To return to the Lotteries web site, click on your browser’s "Back" button or click on "Lotteries" in the games menu of the Espacejeux.com web site. For you to enjoy certain functions on this site, your browser must be set to accept cookies. Find out more. *The grand prize is divisible. **The total amount payable for prizes in the 6/7 + bonus number category is limited to $700,000 per draw. If this limit is reached, the prize amounts will be determined in proportion to the number of winning selections in this category. *The one million dollar grand prize is divisible. Deadline for wagers: Every Friday at 10:30 p.m.
Changes will be made to Québec Max starting with the May 14, 2019, draw. Each main draw is conducted as follows: Loto-Québec conducts a draw to determine at random 8 numbers among all numbers from 1 to 49. The first 7 numbers form the winning selection and the 8th number represents the bonus number. After the main draw, 7 draws are conducted to determine 7 additional selections of 7 numbers each. 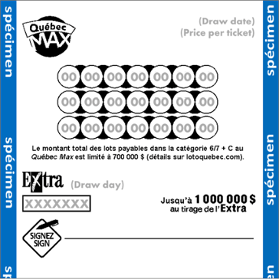 Each additional selection draw is conducted as follows: Loto-Québec conducts a draw to determine at random 7 numbers among all numbers from 1 to 49 to form each winning additional selection. You may play online, using the mobile app or at a Loto-Québec retailer where you can pick your own numbers or opt for selection(s) randomly generated by the Loto-Québec computer. One play is comprised of 3 selections of 7 numbers from 1 to 49. For the main draw, prizes may be won in 7 categories, i.e. 7/7, 6/7 + Bonus, 6/7, 5/7, 4/7, 3/7 + Bonus and 3/7. To win, you need to get, in a single selection, 3, 4, 5, 6 or 7 numbers identical to those of the winning selection. The bonus number, represented by the "+B" symbol, is associated only with the categories 6/7 + Bonus and 3/7 + Bonus. To win in these categories, a single selection must contain respectively, in addition to the bonus number, 6 or 3 numbers identical to those of the winning selection. For the additional selection draw, 7 prizes worth $1,000,000, called “additional prizes,” are offered. An additional selection comprised of 7 numbers from 1 to 49 is drawn for each additional prize. To win an additional prize of $1,000,000, a single selection must contain all 7 numbers identical to those of a winning additional selection. Winning additional selections are not decomposable, and each additional prize is divisible. Québec Max is governed by the By-law respecting forecast contests and numbers games, published in the Gazette officielle du Québec, which includes limitations of liability. 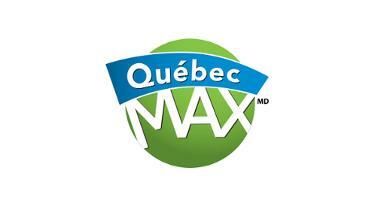 Choose Double Jeu Max to play Lotto Max and Québec Max simultaneously. Choose Forfait lottos to play Lotto Max, Québec Max, Lotto 6/49 and Québec 49 simultaneously. You may play as a group online or at a retailer with Formule groupe. You may purchase play(s) valid for more than one draw. Extra is available with this game. The Replay option is also available with this game. *The total amount payable for prizes in the 6/7 + bonus number category is limited to $700,000 per draw. If this limit is reached, the prize amounts will be determined in proportion to the number of winning selections in this category. The bonus number is indicated with the “+B” symbol. The prize structure and odds of winning indicated above will be in effect until and including the May 10, 2019, draw. They will change starting with the May 14, 2019, draw. Twice as many additional prizes of $1 million will be drawn, for a total of 14 per draw. Draws will be conducted twice each week, on Tuesdays and Fridays. Numbers will be selected from 1 to 50. The odds of winning the grand prize with one play will be 1 in 33,294,800. The odds of winning a $1 million prize with one play will be 1 in 2,378,200. The odds of winning a prize with one play will be 1 in 7.0. The theoretical payoff rate will increase to 47%. The bonus number is indicated with the "+B" symbol. The grand prize will still be $2 million and divisible. The cost of a play will remain at $2 for three 7-number selections. Have your numbers ever won? Use the online ticket checker. Your Lotto Max, Lotto 6/49 and Grande Vie tickets will be purchased automatically according to your specifications! Subscribe to the Lotteries newsletter now! Here’s how to claim your prize. © 2019, Loto-Quebec and Subsidiaries. All rights reserved. In the event of a discrepancy between the draw results presented on this web site and Loto-Québec's official winning list, the latter shall prevail.